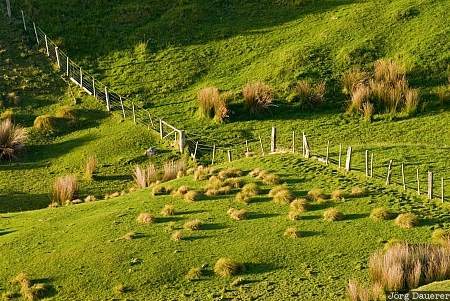 A fence and green farmland on the Otago Peninsula illuminated by soft morning light, Otago, on the south island of New Zealand. This photo was taken in the morning of a sunny day in November of 2008. This photo is part of the exhibition The color Green (February 2009). This photo was taken with a digital camera.